php web application Personal Information Management, Advanced Leave Management, Time & Attendance Tracking, Employee Performance Management, Recruitment Management. Personal Information Management is primarily concerned with the organization of human resources. Hence, the basic objective of personnel administration is to utilize the available human resources in a way so as to get the work done effectively and achieve the organizational goals. HR Management provides an integrated and centralized employee database. It also helps the HR department to manage all the details of employees in the organization for Employee Tracking, configure the settings related to the work structure and also keep a track of all employee activities occurring in the organization. 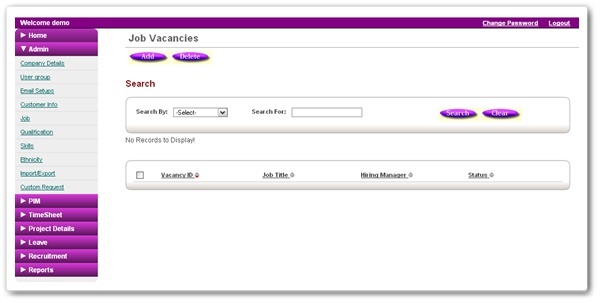 By using this HR staff can perform their work efficiently and run management reports quickly. PlanMyLeave’s benefits both employers and employees by giving a fair and transparent leave approval workflow, access to leave balances and current status information. Employees can view current leave balances, request leaves, view past leave history, and managers can review and approve leave applications on the dashboard. All this ensures time and cost savings as well as a rise in productivity of the organization. It contains various features to coordinate all aspects of employee time management including In-Time, Out-Time, Late Comings, Early Goings, leave Management, Overtime, Holidays, Roistering and more. This allows HR to focus more on core HR related issues then to just handle and resolve queries related to employee time office. It is a very advanced time systems solution built on latest technologies that can provide various analytical reports, statics and information to assist in managing and regularizing employee time office management of any organization. It is designed to meet the unique needs of front line service operations. By delivering personalized performance data to every employee in the organization while automating critical managerial activities, the solution helps organization to increase accountability and establish a culture of continuous improvement essential to reaching business goals. This module allows you to enhance your recruitment process by making it simple, transparent, intuitive and interactive. It incorporates functionality to structure and speed up the recruitment process; so that the organization can acquire the right talent from a long term perspective. This enables you to build up and source from a qualified, global pool of internal and external talent. Applicant-tracking and reporting functions help organize the processing of job applications and monitor the effectiveness of the recruitment function.